Drafted by the Orioles, 4th overall in 2011, the beefy Oklahoman had everything you could possibly want in a pitching prospect. Thick, strong frame, a devastating fastball, an equally devastating changeup, advanced control on all his pitches for a high schooler. Bundy had so much promise that 6 months after being drafted he was the #2 overall prospect in baseball by MLB.com. Bundy seemed as sure of a thing as a pitching prospect could be, and then as is common with fireballing high schoolers, Bundy’s elbow popped. 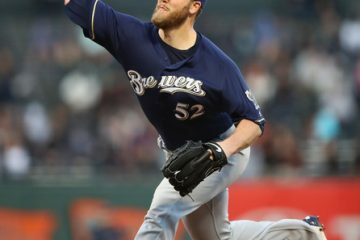 He underwent Tommy John missing all of 2013 and then briefly returned in 2014 until a calcification in his shoulder sidelined him for an extensive period of time yet again. When Bundy returned, his triple digits fastball was gone and so too was the bright prospect shine he once had. So what was the difference between the first three months and the last three? The first thing that sticks out is his pitch mix. 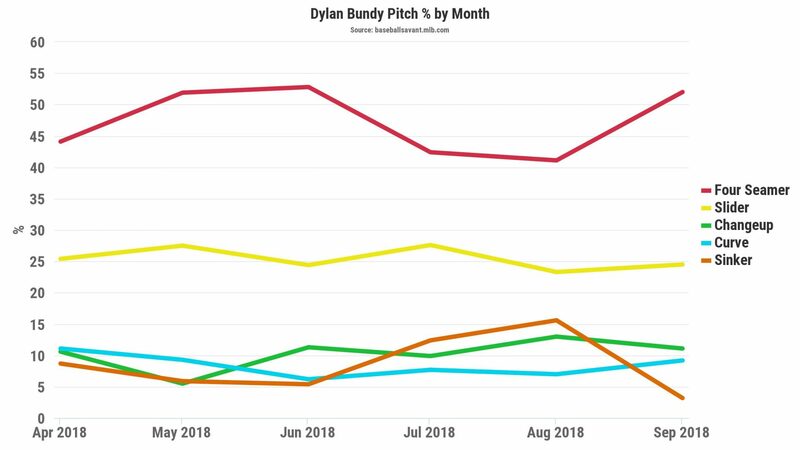 In the first three months, Bundy was throwing his fastball much more often than the last three. When he started using his sinker more, he got knocked around much harder. 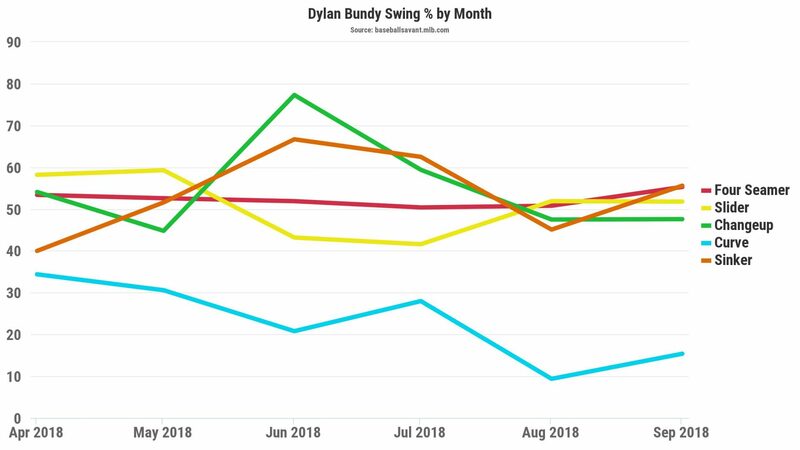 Once Bundy started throwing his sinker more often, he got much less swing and miss on it. When he was using it sparingly to keep hitters off balance, it was much more effective. The other thing that stands out about his swing % is that on just about all of his pitches the swing % went down over the last three months of the season. Even though Bundy’s fastball isn’t hitting triple digits or even 95+ on a consistent base, it’s still his best pitch. It’s easy to say “well if he goes back to throwing it more, he’ll be successful again” but in just about every pitcher’s case, when they throw their fastballs more, they have less success. That just adds to the confusion of how much better Bundy’s first half was over the second. I want to believe the skill set is still there and this will be the season he puts a complete performance together, but with his inconsistencies, it’s impossible to commit to that take. In short: I’unno, bro. Hope is never a bad thing, but I’d leave hoping on Bundy’s breakout to deep leagues only heading into 2019. Have you heard? 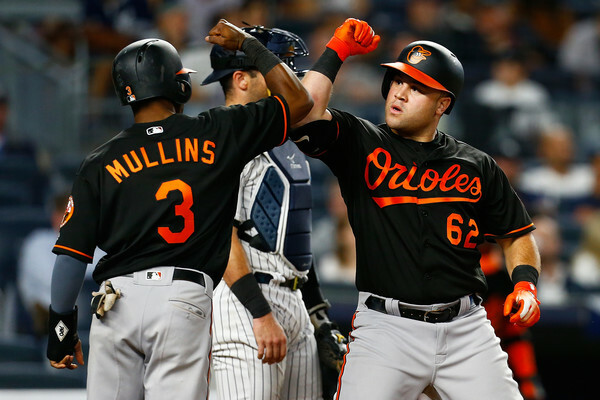 The Baltimore Orioles are bad. Yet down there, in that ugly bird-pit of despair, a minor-league outfielder made a decent impression. He had performed well in the minors by slashing .274/.330/.450 across Double-A and Triple-A, flashing average power and potent speed. For a player who was drafted in the freakin’ 13th round (403 overall), the Orioles may have gotten themselves a steal. But what about we dynasty owners who stashed Cedric Mullins away late last year, or are thinking of claiming him off waivers? Between two levels last year Mullins put up solid numbers before reaching the MLB. The Orioles potential Opening Day centerfielder slashed .290/.347/.469 with 11 homers and 21 steals. However, like most minor leaguers, those numbers didn’t quite translate in his first 191 at-bats. And despite making a ton of contact (83.1%), the batting average wasn’t there for Mullins. He batted a mere .235, but did manage to smack four bombs and steal two bags. Unfortunately, he struggled with left-handed pitchers, batting a gross .156 against them. Mullins also hit the ball on the ground 50% of the time, with an average exit velocity of only 85.1 MPH. So some good, some bad, but certainly not an overwhelming debut. The potential for an OF3-4 is here, with the primary upside being the power and speed potential Mullins offers. Truth is we can’t take all of the numbers Mullins posted in his major league debut all that seriously because the sample size is so small. However, there are a few take aways and hypotheses we can make due to his minor league track record, environment, and Statcast measurements. First: we know that he’s very fast. 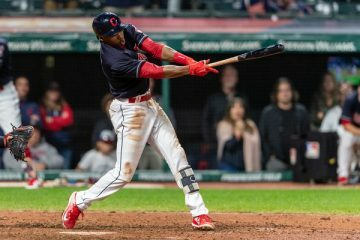 He’s been touted as having plus speed from multiple sources, and his Statcast Sprint speed placed him in the 95th percentile. Most projection systems have him pegged for around 15 stolen bases, but I’d be willing to throw him in the 20+ bucket if he gets a full season of at-bats. Second: Camden Yards ranked 9th in the league for home runs last year, and Mullins should be able to take advantage of that. He’s hit the ball with more authority in the minors, and thus I’m not overly concerned with the low ISO and exit velocity he posted in 2018. I’d expect to see his ISO jump up to at least .150 and I bet he can get to 15 homers. If he can improve on his power, I’d expect the average to rise as well to somewhere near the .260 range. The power, speed, and average combination make him an interesting option for an OF3 in 2019. Besides Mullins’ speed potential, there isn’t anything about his profile here implying that he’s all that valuable of a dynasty asset- hence the OF3-4 ceiling. He has age on his side, and an interesting enough skill-set. Still he won’t be setting the dynasty world ablaze by any means, but he makes for a sneaky source of power and speed with an average that won’t kill you. Mullins shouldn’t cost a lot in any league making him all the more appealing, and he may even be available on your waiver wire as he wasn’t ever a prospect with much hype or pedigree. He’s not an asset that will win your league, but he’ll certainly help you get there. Diaz was, by most accounts, the key component in a deal that sent Manny Machado from the Orioles to the Dodgers last year. At 19, the Cuban international was a massive bonus baby ($15 million!) during the Dodgers’ free-spending days of 2015. From then on, he played a respectable – but not stellar – brand of baseball that kept him hanging around the top 15 in a loaded Dodgers organization. While other starlets were promoted or fell off the radar due to bad performance (cough – Yasiel Sierra – cough), Diaz stuck around. Now, he’s one of the cutest prospects among a group of ugly and malnourished names. There’s a place for you on a big league roster when you’re pretty respectable, albeit not amazing, in all facets of the game. For a Baltimore squad that has lost the glow of an early 2010’s run due to age and contracts (e.g. Adam Jones, Nick Markakis) as well as some names that never panned out (e.g. Hyun Soo Kim, Steve Pearce), Diaz is exactly what they need. Something stable. In his second stint in Double-A, Diaz posted some nice numbers. double-digit walk rate, a respectable on-base percentage plus a bit of pop and some speed, while playing against players a few years old than him? Diaz has the feel of a player that’s better than the sum of his parts. Is there anything more than a second time through Double-A to account for his progression? Well, based on scouting reports, improvements come on the heels of a reduction in swing mechanic noise. In 2017, Diaz featured a pretty prominent leg kick as seen here. In 2018, he toned it back a bit by bringing the foot back and forward without leaving the ground as he had in past years. The change flattened his swing plane, so no longer selling out for power and focusing more on a contact, line drive…uh, driven… approach seems to be where Diaz would prefer to be moving ahead. Seriously though, I can gripe about service manipulation with the best of them, but Yusniel hasn’t had an at bat above Double-A. He’s not a superstar prospect either. It may be a stretch to say he’ll be up in the majors this year despite a strong showing this spring. If I were to make an educated guess, he’ll be in Triple-A the entire 2019 campaign and he’ll struggle. It wasn’t exactly all roses when he came over from the Dodgers last July. More importantly, he’s now with an organization that wouldn’t even get a participatory trophy in the player development competition. That doesn’t mean he’s bad! Just a by product of a bad organization with no real reason to pay their best prospect a fair wage when they’re not competing despite his being ready! I like Diaz. I’m kicking the tires on anyone who has him to see what their value is on him. Jesse Roche has him as the #50 prospect in his 2019 Top 500 Prospect List. That feels about right. Although I gaze at outfielders below Diaz that could easily jump him by 2020 simply on their good performances more so than anything about Diaz’s struggles. Remember, unremarkably average – which is exactly what Diaz is – can deflate a prospects value. If you’re anticipating your window to begin in 2020 and looking for an OF3, go get him.